Although I’ve known about it for years, I’ve never tried participating in NaNoRenO. For those who don’t know, NaNoRenO is to visual novels what NaNoWriMo is to novels. Basically make a VN in a month. It takes place in the month of March and for some reason it’s existence completely slipped my mind this year. It was already a few days into March when I realized it had started. I figured I have a project I’m working on and one on hiatus so… why should I bother? Then, 3 days ago, I decided to try it. I don’t know what came over me. Probably the idea of not working on projects I should be working on and starting anew. Starting a project is the most exciting part aside from actually finishing one, after all. It’s the part in the middle that’s annoying. It’s when you don’t really feel like working anymore and you’d rather do other stuff, so you stop. “I’ll just do something else today and come back to it tomorrow.” is what you say to yourself. But then you say the same thing the the next day, and the day after that, and so on. But giving myself only 18 days should keep me from actually stopping at any point. I wanted to keep the project a secret in case I don’t feel like finishing or fail to meet the deadline. But a deadline isn’t a deadline if you keep it to yourself. Where’s the DEAD in that? So now you know. I’m doing NaNoRenO. I’m doing a pretty short romantic comedy thing, not sure how it’s going to turn out. It will have only 2, or 3 endings at most. Originally I had one ending in mind, but that’s boring, so I’ll just have to come up with something to make it all branchy. What can you even do in 3 days? March 13 Came up with the story based on an old idea and named said story. Did the menus (main, load/save, prefs, yes/no), choices graphics, textboxes. March 14 Saved the menu files into different states (ground, idle, hover, etc) and coded them in. I imagine no one likes that part. 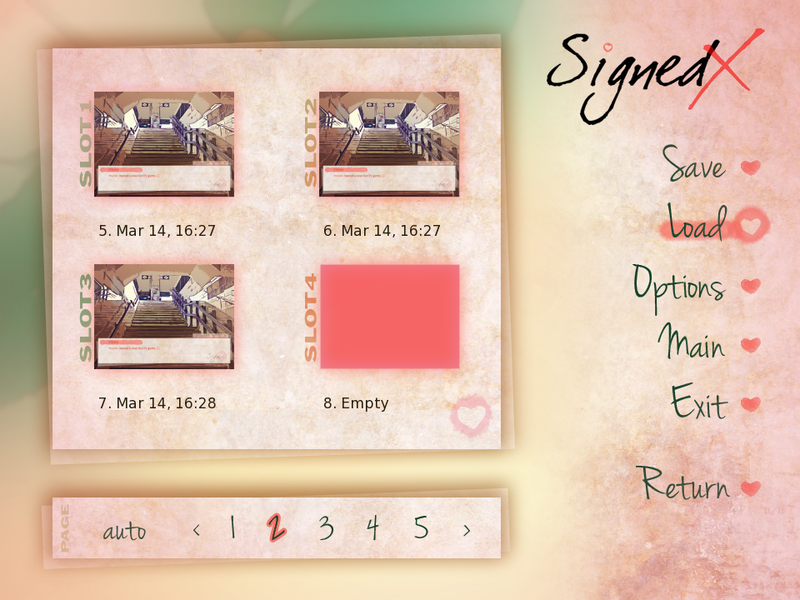 Then wrote a little and made some backgrounds from photos, experimenting with effects. March 15 Named the characters (formally boy X, boy Y and MC ). Wrote about 1500 words and made more backgrounds. Did sketches for boy X and Y (now Warren and Matt) and fully drew side image for MC. For tomorrow I plan to write some more, draw Warren and Matt and code at least the MC’s sprite. So what is this VN actually about? First off, it’s called Signed X. 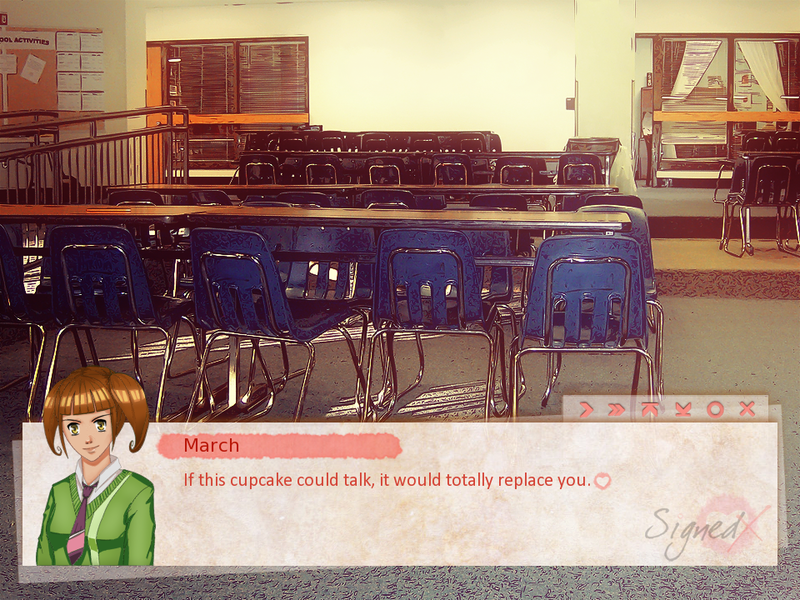 Plot: The MC (default March, becauselolwhynot) arrives early to school to find a boy from another class leaving flowers on her desk. She hides, so he doesn’t see her, not wanting the situation to be awkward. So how will our nutty, hopelessly romantic, manga-loving protagonist deal with the situation? She will try to recreate romantic scenes with her secret admirer, Matt, in order to get him to confess his feelings. Duh! Fortunately, the reluctant Warren is there to help. Will she succeed, or will all her plans fail miserably? Hint: it’s not the former. Now let’s see some pictures! Please excuse any mistakes, it’s waaay too late to reread this.